Many people feel that the Reception is just an area where people check in, sit and wait for appointments. That perception couldn’t be more wrong. If you think about your reception area and how it looks to potential clients, members of the public or just visitors, would you feel invited? Would you understand the company’s image and what the company stands for? If not, then the company is not utilising the areas potential. To coin a phrase “Never judge a book by its cover”, it is a phrase that has been used through generations and the fact of the matter is PEOPLE DO!! A judgement of your company will be made merely by walking through the door. So, it’s of paramount importance to make sure that your cover looks the part and represents the image of your company. Why are Reception Areas so important? Customer’s and potential clients are the ones that keep us all in business and seating for those clients is arguably the most important part of the reception area. Make sure they are comfortable and feel relaxed. If your company has a lot of visitors per day make sure they have plenty of room -the last thing they want is to be practically sitting on the knee of the total stranger next to them. A coffee table always adds a bit of class to the room and also a homely feel. It’s the little touches that add to the character of the reception and thrill potential clients. Try adding a few newspapers or a T.V – it will keep your clients amused and avoid any disappointment if they have to wait. Introduce elements of your company colours in the reception area to ensure brand consistency and pictures that reflect the company’s ethos. 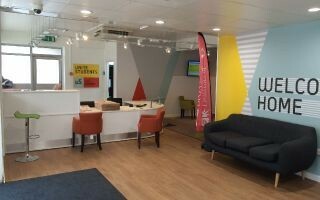 Other little touches include a water dispenser or a sign that reads ‘tea and coffee are available for all our clients’. Now the customers and clients have been looked after, it’s on to the main focal point – the reception desk. Not only will it need to have a great look, it will also need to be suitable for staff requirements. Before making a decision on what reception desk you want, it could be worth having a discussion with the receptionist to see what input they have. 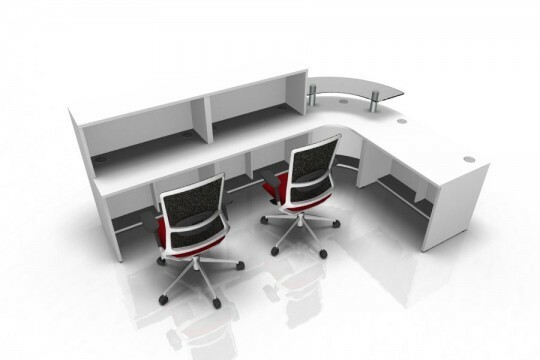 After this, you want to think about what desk will reflect the company’s appearance best. Your reception area should be functional, appealing and aesthetically pleasing. One of the fundamental factors to consider is the purposes that this space will serve. If the area will be used for various functions including hosting visitors, receiving and accommodating deliveries, as an unplanned meeting area and so on then crucial features will need to be incorporated into the design. Finally, the receptionists’ chairs need to be reviewed as part of the renovation process. The chair needs to be practical and comfortable to ensure a happy receptionist to greet the clients (I can’t see a receptionist being too happy with working for 8 hours a day on a wooden chair do you?) so comfort must be at the forefront of any decision. Design wise, keeping in touch with the appearance of the rest of the reception area is very important. After working so hard on achieving the reception area your company has always wanted, don’t ruin it with a lacklustre decision that could potentially ruin your hard work and attention to detail in every other area. We understand that the reception area of most businesses is the area that creates a first and lasting impression. It conveys your message to your visitors. Time for a facelift? Have a chat with a member of our design team who will work with you to visualise your face of the future.